Google could be working on its very own VPN service for Android, which might get an official launch at some point in the near future. This revelation comes from a look at one of the apps that are bundled in the Android 5.1 Lollipop update for the Motorola Nexus 6. After applying the update, among the list of installed apps is something called Google Connectivity Services. You can’t see this in the app drawer, but it’s listed under Settings > Apps > All. You can run it, but only after fiddling with a dedicated app for handling the launch of activities (the string is quite long). If you want to try this yourself, the full details are waiting for you at the Source link. But the gist of it is this: once you launch the Google Connectivity Services app, you see the screen that’s captured in the middle of the image above. 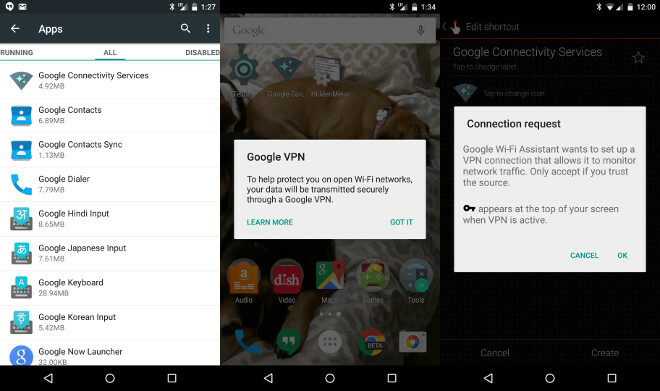 The app clearly tells you that you’re about to use “Google VPN”, which will help protect you while you’re navigating on open Wi-Fi networks. You’re also told that your data will be transmitted securely. “Learn more” simply directs you to a standard Google support page, but if you tap on “Got it”, you’ll be presented with the screen you can see on the right of the image above. That’s pretty much the standard VPN connection request dialog in Android. Unfortunately Google’s VPN doesn’t work for now, even if you do complete all these steps. But since this app is already a part of Android 5.1, we assume the launch of this service can’t be far off. That said, it’s unclear if it will be available to everyone or just some, or if it will be free to use and offer unlimited bandwidth or not. There are currently dozens of VPN services up for grabs in the Play Store, some free and some paid, but obviously an offering that comes straight from Google itself (and is already built into Android, starting with version 5.1) might convince more people to use it. Then again, this may have something to do with the upcoming launch of Google’s MVNO in the US, so perhaps it could be limited to that service’s customers.